I am in love. 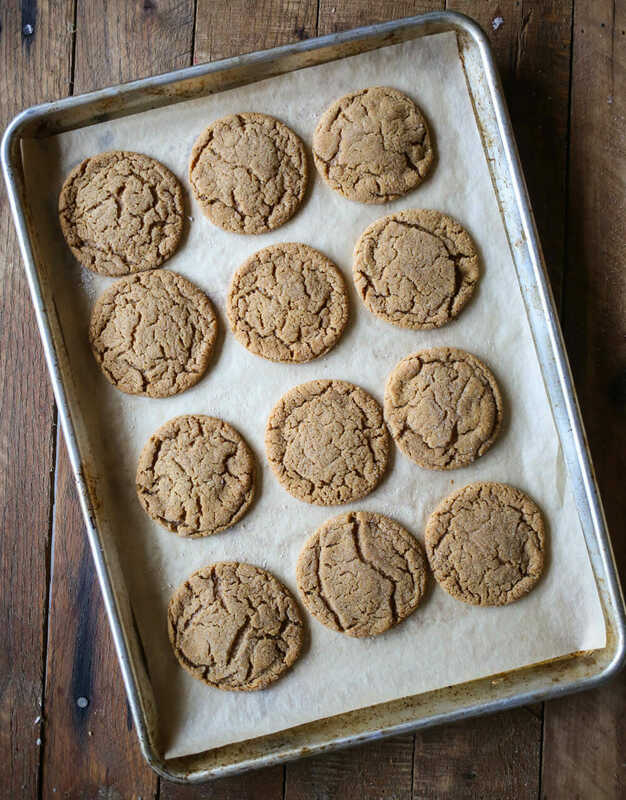 With these soft and chewy ginger spice cookies. These are the kind of cookie that you need in your cookie jar. And if you don’t have a cookie jar, it’s the type of cookie you should buy one for. I didn’t even know I was a ginger-spice-molasses type person until I ate these. I looked at the recipe and it looked pretty basic so I was trying to think of something to snazz them up. I thought about sandwiching them with cream cheese frosting, adding orange zest, dipping them in white chocolate etc. But that all changed when I took a bite of a cookie warm out of the oven and I knew that these little beauties needed to stay exactly like they were. Some ginger cookies are soft, some are puffy and cakey. These are are chewy. They’re a little on the thinner side and they crisp just around the edges and then get soft and perfectly chewy in the middle. My kind of cookie. 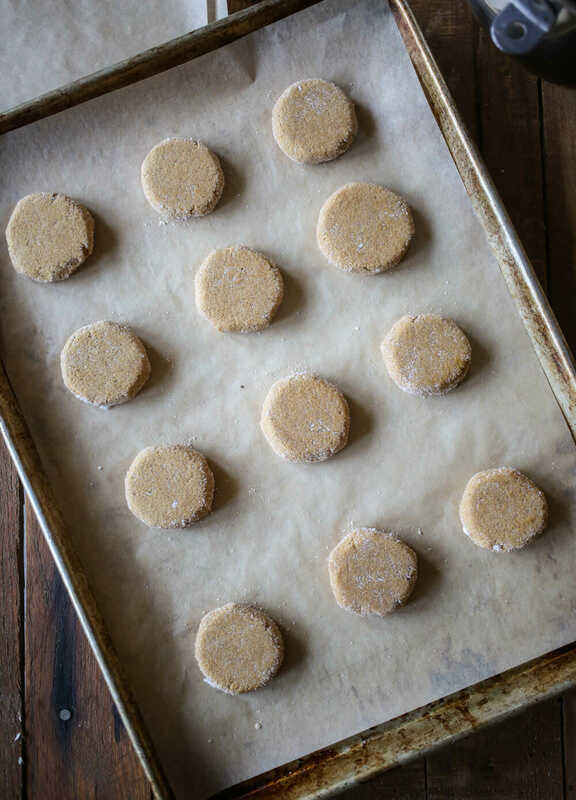 These cookies are so simple and inexpensive–you probably already have everything in your house, and if you don’t, you should because they’re pantry staples. 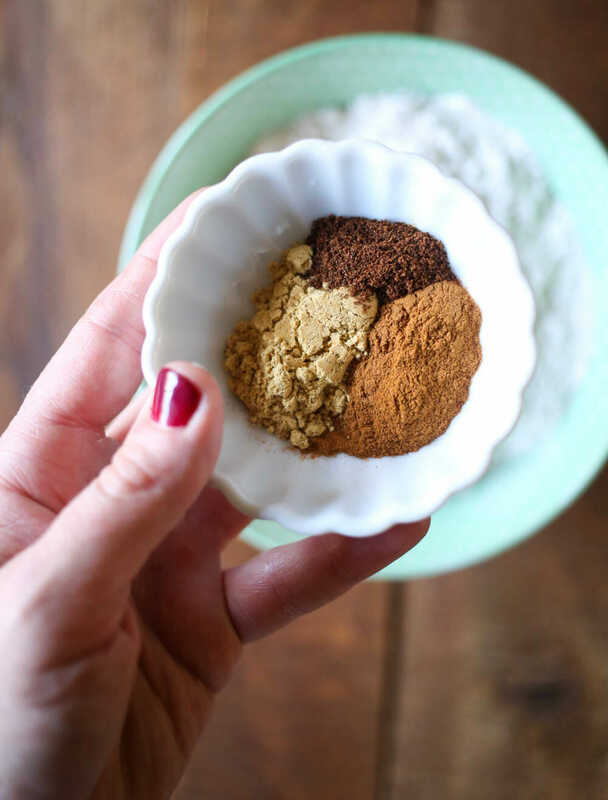 You’ll need flour, sugar, cinnamon, ginger, cloves, baking soda, and table salt. 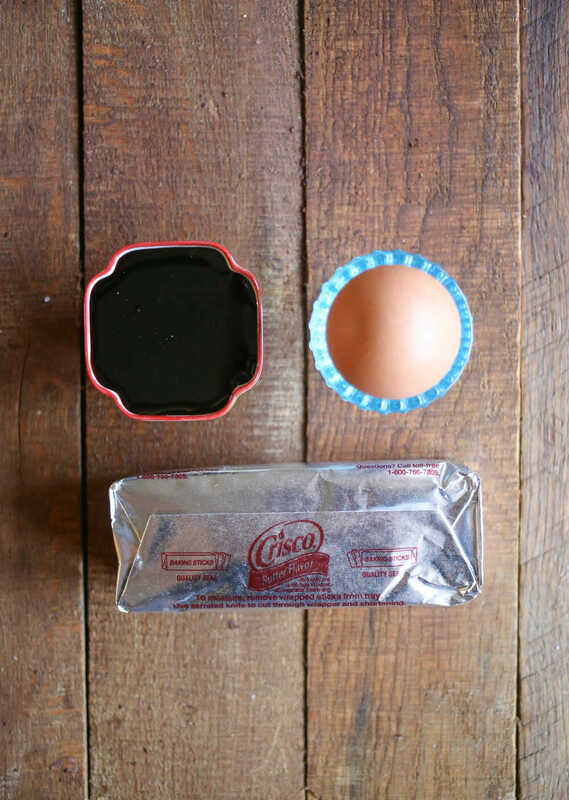 You’ll also need an egg, some molasses, and some butter-flavored shortening. Yes, we are aware that shortening is a controversial ingredient. My position is that a) it’s nearly trans fat-free and b) there are a few recipes where shortening usage (in my opinion) is a must–pie crust, fried chicken, and these cookies and c) if you’re eating any of those foods often enough to cause health problems, it’s probably less about the trace amount of trans fats and more about the fact that you’re eating pie crust and fried chicken and cookies in alarmingly large quantities. You’re welcome to substitute something else for the shortening, but if you come back and say, “I used coconut oil and my cookies tasted gross, kind of coconut-y” or “I used butter and my cookies fell flat and were as hard as rocks” or “I used the tears of virgin unicorns and now my friends and family say that virgin unicorns don’t exist and I have become a social outcast,” I might be a little bah-humbug-ish. Preheat your oven to 350 F and line two baking sheets with parchment paper (these sheets are fantastic!) or Silpat liners. Cream your shortening and sugar together for a couple of minutes until it’s light and fluffy. and then mix until combined. 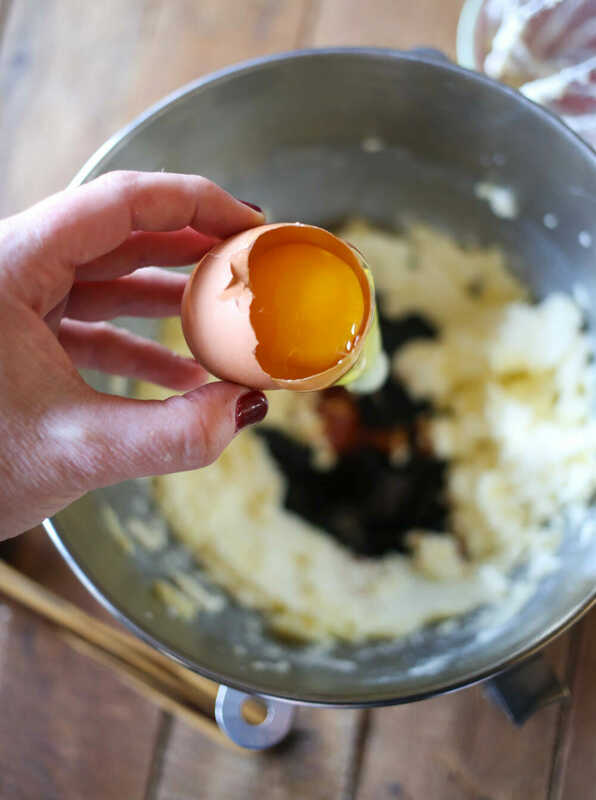 While the egg/sugar mixture is mixing, whisk together your dry ingredients. Then add them to your creamed shortening mixture. and then roll the dough ball in sugar. and then place it on baking sheets. Repeat with the remaining dough. If desired, you can use a flat-bottomed cup or mug to gently press them down. Aside from measuring out brown sugar, I’m not sure there’s a more satisfying cooking task. They will puff up a bit while baking and then flatten out when they cool. Perfect for stacking, packing, and snacking. And I know I said they shouldn’t be messed with, but the one thing they’re practically begging for is to be turned into ice cream sandwiches. Under cook them just a bit and then smoosh them with pumpkin ice cream, or homemade vanilla with cinnamon would be awesome. And we also have this scrumptious variation! Preheat oven to 350 F. Line 2 cookie sheets with parchment paper or Silpat liners. Set aside. 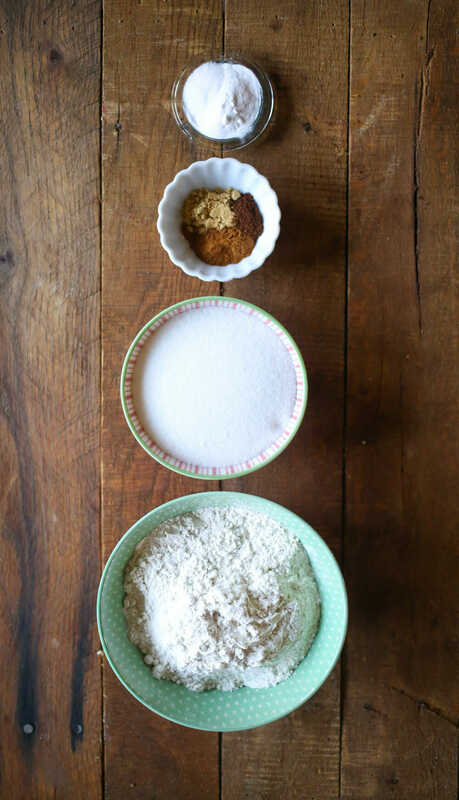 Combine sugar and shortening in the bowl of an electric mixer and mix until light and fluffy (about 2 minutes). Add the egg and molasses and beat until completely incorporated. 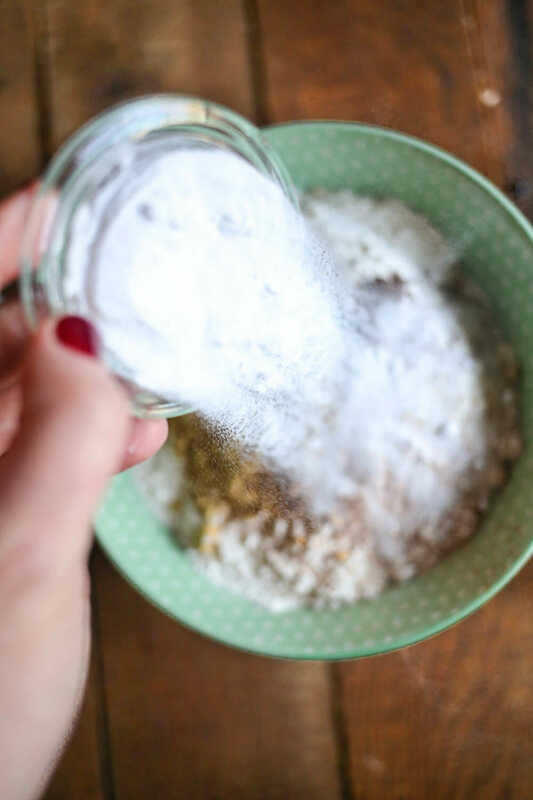 While the sugar mixture is mixing, whisk together the flour, baking soda, cinnamon, ginger, cloves, and salt. Add them to the creamed shortening mixture and mix until combined. 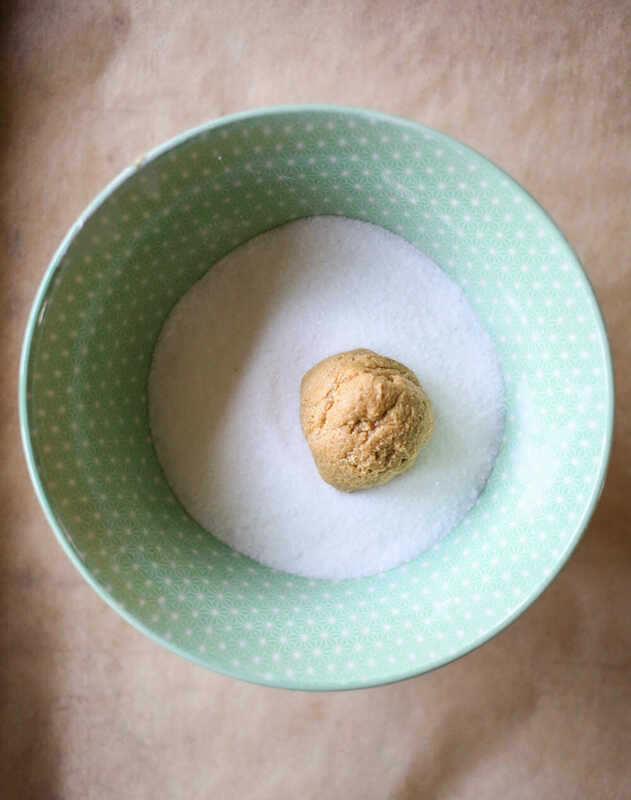 Using a standard cookie scoop, scoop the dough into balls and roll in sugar. Place 12 dough balls on each cookie sheet. If desired, use a flat-bottomed glass or mug to gently flatten the dough. Bake for 8-10 minutes or until just set around the edges and you start to see crackling on the top. Be sure not to overbake! Remove from oven and allow to cool completely before removing from the baking sheets. 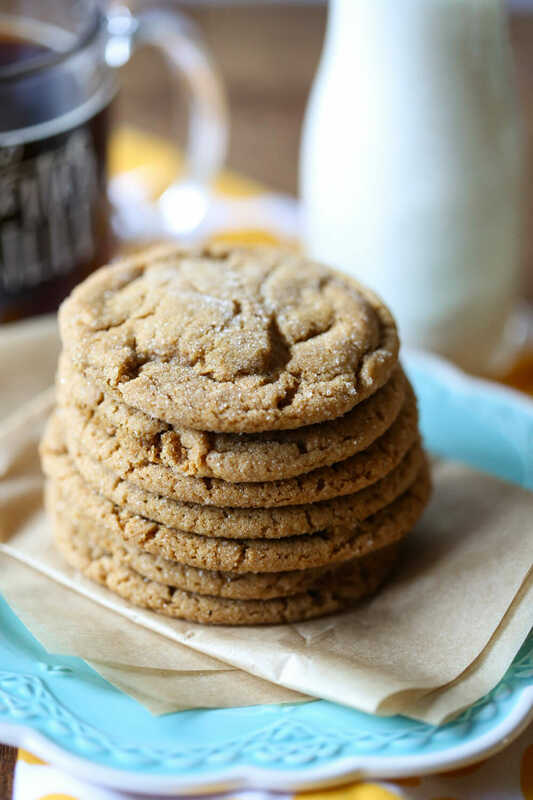 *I’ve* been looking for the perfect ginger spice cookie, so I cannot WAIT to make these!! Yum! Have you tried making these with real butter? I don’t have any crisco, but I would love to make these… Just wondering. 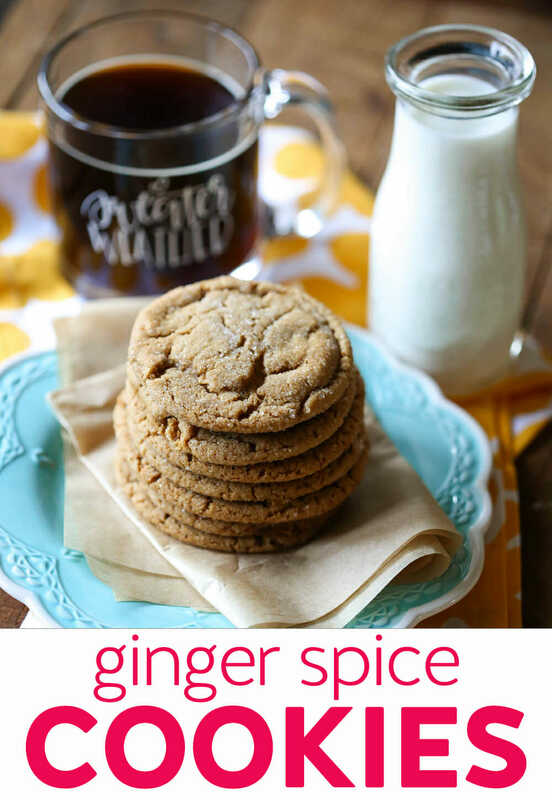 I make ginger spice cookies with butter – my recipe is very similar to this one and everyone absolutely loves them. The trick with butter is creaming it when it is cold. If it gets too warm and soft it will flatten in the oven. You can even refrigerate the dough before you roll it into cookies if you want. My cookies never flatten, so it is impossible. are they soft or crispy cookies? if they are soft and chewy I am sold! lol. Camille- these are for you. They are just barely crisp around the very edge and then they’re super soft and the longer they sit the chewier they become, especially when they’re really thin. Amber- I haven’t tried with butter. Normally I’m an all butter all the time type of gal, but the exception is cookies, when often crisco yields a better texture. Butter may make these cookies spread more and become crispy instead of soft. But I don’t know- if you give it try let us know! My daughter and I just made these, and they ARE as good as you say! We ate them just plain, and as ice cream sandwiches, and either way, they are delicious! And now my house smells yummy…thanks! These look really good, I am loving treat week! thanks Sara, I am going to make them today! I have to make “fall” cookies for ds’s preschool class (no halloween cookies allowed, LAME-O). I hope the 3 year olds like them, cross your fingers!! I just wanted you two to know that I have been looking at your blog for a little while and I really like it so I have nominated you for an award over at my blog iamfrugal.blogspot.com. You can see all the details for the award by going to my blog. camille- I bet kids will love these. I am a cub scout leader and someone brought cookies last week that tasted just like this and the 8yr old boys just gobbled them up SO fast. Plus, my 3rd old loves them! I have a very similar recipe from my MIL and we love them! Warm out of the oven, they are so soft! These were very good, even the batches i slightly overbaked.oops. I used butter instead of the shortening and they seemed fine to me. I tried making these yesterday(the dough was EXTREMELY good by the way. Really spicy), but the problem was that the dough was entirely too sticky. I would try and roll it in sugar and it was a mess. So, I added about a half cup more flour but it was STILL too sticky. I figured I shouldn’t add more flour if I didn’t want them to be too tough, so I just rolled them in sugar the best I could and flattened them as instructed. I just wanted to know if you really meant TWO cups of flour in your recipe and not three. Because I was sure something wasn’t right. Maybe it’s because I substituted maple syrup for mollases…? Try chilling the dough before you scoop and roll in sugar. My recipe says to chill for 2 hours before rolling, although I stick it in the freezer for a shorter time. It makes the dough much more manageable. I’d say there’s a 99% chance that your problems are directly related to your lack of molasses. Try it as the recipe is written and if you still have problems then we’ll talk! These look georgous, i saw them on foodgawker. I totally want to make them. I live in the Uk. I can find crisco here, but not butter flavour. Do you think that would be ok? Heavenly housewife…you could try half crisco and half butter. I have had success in other recipes using half and half. I love the crinkled, cracked tops. These look delicious! I made these hoping to have a replacement for the Amish molasses cookies I get from a bakery in my hometown. They were good but with a bit too much molasses flavor for me. The texture turned out great though! Next time I may cut down the molasses a bit. I also made the pumpkin ice cream to make sandwiches with. It just came out of the ice cream freezer and tastes delish! I can't wait to put the two together. 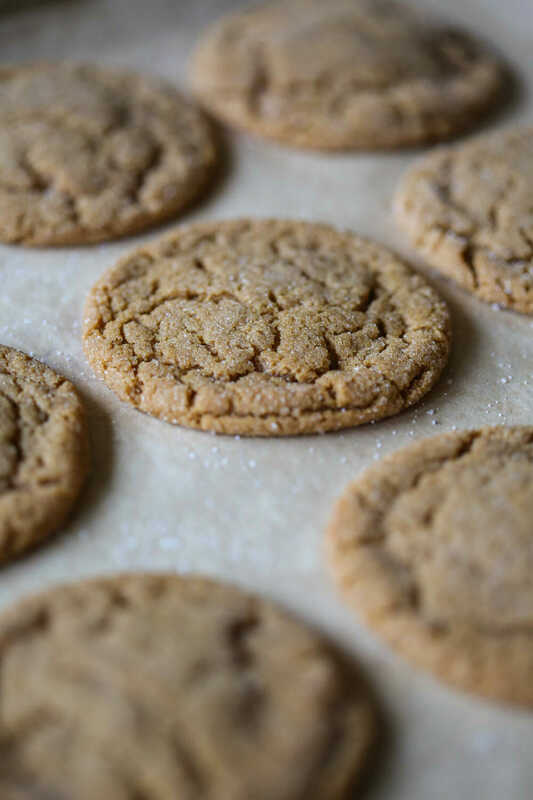 This is exactly like my grandma's recipe (she called them cookie jar gingersnaps) that she made all the time when I was growing up, except she used regular crisco because they didn't have the butter flavor around then, and 1/2 t more cinnamon. I made them that way until about seven years ago when I finally discovered butter flavor crisco. So, for Heavenly Housewife, I can tell you from experience that they are still delicious with the regular crisco. Perfectly soft and chewy. Ok, I made these the other day and am ADDICTED! Seriously, one of my favorite cookies ever!! I was freaked out because I was on the phone (I do the weirdest things while I'm on the phone… like I put cereal in the fridge and milk in the pantry once) while making these and accidentally put in 1 full tsp of cloves… they still turned out delish! These would be PERFECT for neighbor gifts. Thank you!! This is very similar to my recipe, and they are one of my absolute favorites! Thanks for all of your wonderful ideas. This is the most awesomely beautiful cooking/baking site ever. And this is the first time I've ever been inspired to Blog. Yay. I made these today for neighbor gifts for Christmas and LOVED them! I made them with half butter and half shortening. They turned out perfectly, just like the picture. Thanks for this wonderful recipe! The dough is GREAT!! They haven't made it the oven yet, but I am impressed already. Just made these beauties to put in tins to give as gifts to clients. They look so pretty all wrapped in ribbons, and the few we taste tested were scrumptious! Next time I am going to plop a pumpkin spice hershey kiss on top when they come out of the oven for my take on your pumpkin ice cream sandwich. Would have this time, but wanted to wrap in a pretty Christmas ribbon. Thanks for the great ideas! Once again…YOU HAVE DONE IT! Seriously a piece of heaven! I don't know if I will ever make Gingerbread cookies again becuase these are so amazing! My kiddos are seriously running circles for them! I don't know if there will be any for Christmas! I'm pretty sure these are the best cookies I've ever had. Thank you! After they come out of the oven put a Pumpkin Spice Hershey Kiss (you can get at Target right now but only for a limited time). Heaven!!! It just puts them over the top. have you made these with plain crisco rather than butter flavored? i have so many sticks of plain crisco i'd love to use up! two forks- sure, plain crisco would be fine! I love ginger snaps . . . one of my all time favorite cookies, and this recipe is Easy and Super Yummy! My four year old son and I made some today . . . SUCCESS! THANK YOU! I made these the other day and the whole process was just a comedy of errors. Once I started I realized I was almost out of sugar. Not wanting to go to the store I used what I had and made up the other 75% by using brown sugar. When I moved to the dry ingredients, I realized I was out of flour! Not much to do but head out to the store (after lunch and nap time), both kids in tow. Got home, started making them again when I realized I couldn't find my GINGER! So I substituted pumpkin pie spice. All that being said, as soon as I took a bite I was hooked. My husband made me sit down and copy the recipe over from the scrap of paper I had written it down on, to my book of recipes right then and there. These were worth all the trouble it took me to make them and then more. My new favourite cookie! I love these kinds of cookies too, but I'm anti-Crisco. 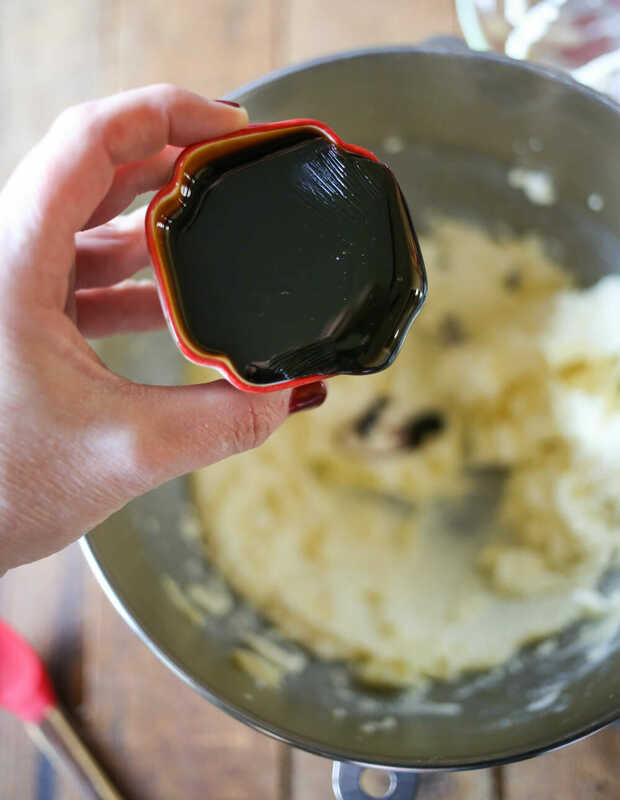 I found a similar variation years ago which calls for oil instead (doesn't flatten for me…nice and chewy!) The brown sugar does something nice for them. Mix half the flour with everything but the rolling sugar, then beat the other half of the flour in. Bake sugared 1" balls at 375 F for 8-10 minutes, or use a small ice cream scoop for larger cookies, and bake a few minutes longer, until crackled on top. I want to try your orange zest & white chocolate version with these! I just made these (amazingly enough, i had EVERYTHING on hand!) for some last minute gifts, and I had to hurry and package them up before i ate all of them! I was able to get 30 cookies out of the batch (definitely could have gotten 31 or 32 had I not eaten some of the dough) using a cookie scoop. I baked about 7 different treats at Christmas this year, but THESE were the biggest hit of all. My family loved them! I was absolutely smitten with the Candy Cane brownies, but my boys begged for more of these. Thanks for sharing. I have a feeling I'll be making them year round! Just like my mom’s recipe—the BEST!!! Get a little daring and dip half in chocolate or white chocolate. The combo with the spices will make your taste buds sing! 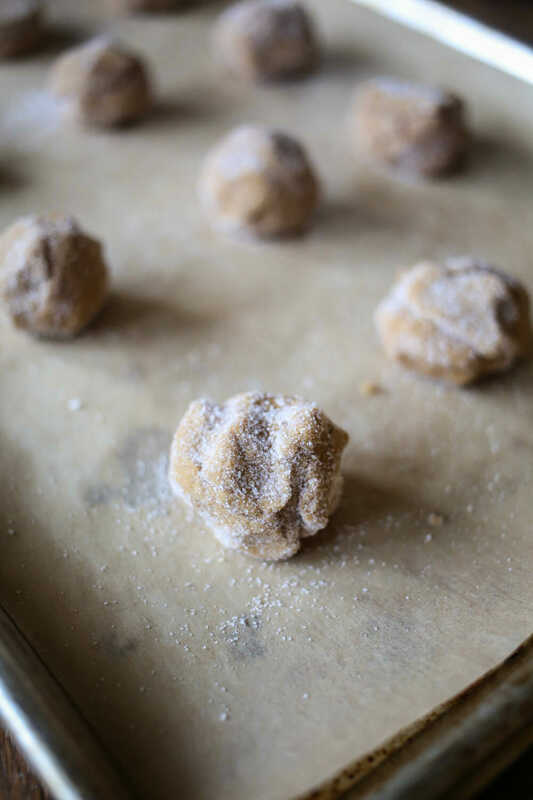 Growing up, my Grandpa and Grandma always had Gingersnaps in their camper and in their boat – we didn’t know that they were called Gingersnaps until we were older, we just always knew them as Grandpa Snow cookies. These look super yummy and like something nostalgic at the same time. Thank you for sharing! And they are just as yummy without the salt. I am looking forward to making these. Time to go to the grocery store! These are my favorite type of cookie, I make them every Christmas. Butter in cookies is so much better than shortening. The key is to thoroughly chill your dough. If you do that, the cookies will stay almost in balls the whole time they’re baking. I use a baking stone, bake them at the minimum time on the recipe (I always use a thermometer in my oven, too—you’d be surprised how far off even the most expensive ovens are!) and take them out. I use a spatula and gently press them down to get the air out, and they are perfect every time. I don’t do many things well, but cookies are one thing I **do** do well. 🙂 Try them with butter, and don’t add more flour. 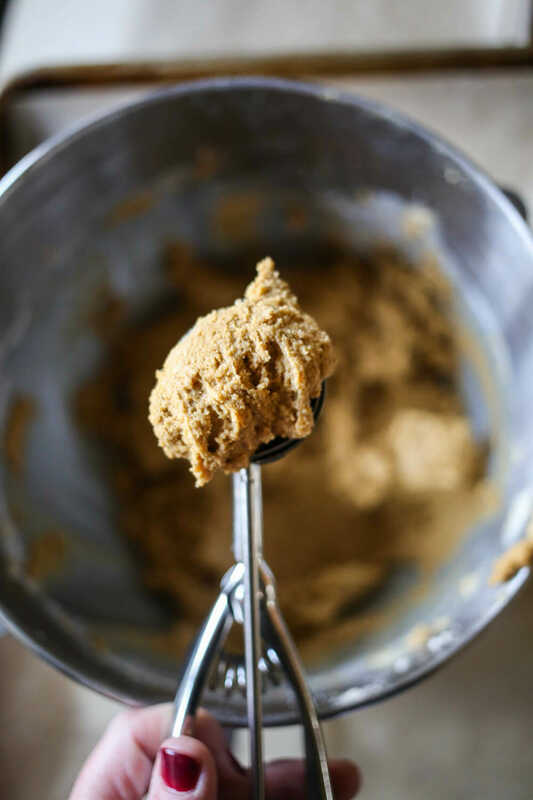 Molasses cookies will be very sticky, but this problem is resolved by chilling the dough. When you roll them, don’t handle them more than you have to so the fat stays solid. If they get hard to roll, put them back in the freezer or fridge for 10-15 minutes until they’re cold again. This is absolutely true – I have been making cookies for years and everyone wants to know why theirs always flattens and mine aren’t and I always tell them the same thing – the butter has to be stiff. 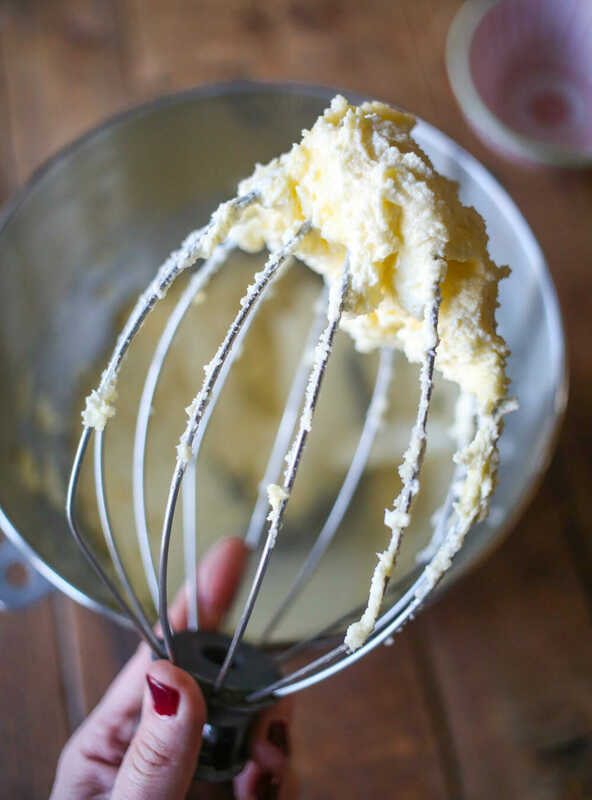 If you have a stand-up mixer with a paddle, you can cream the butter just until it’s not lumpy and get the same result. Lisa…do you use a 1:1 ratio of butter or is it less? I finally figured out a way to get my choc chip cookies perfect w/butter, but I have to use half as much. I was wondering if it’s the same for these cookies….thanks! I made gingersnap oreo cookies last week and used a pumpkin spiced cream cheese frosting and they were delicious! I made these today. So yummy and just the right texture. Perfect cookie for a rainy fall day. These will definitely become a family favorite! Thanks for the recipe! I made these exactly as directed. They looked perfect and the texture turned out as advertised with crispy edges and chewy centers. That said, these are not my favorite tasting ginger cookies. I think the crisco is what ruined it for me. I would recommend making these but substituting real butter for the crisco. Love, love the taste of these cookies! I followed the recipe exactly, but my cute little sugared dough balls never flattened. Help! They crackled on top, but remained soft and plump. I used a shiny, substantial aluminum baking sheet with no silpat. Any suggestions, friends? Thanks for all of your wonderful recipes! That’s totally weird lisa! Are you at a crazy elevation or something? Ha! No, I am in Minnesota. 🙂 I have a thermometer in the oven, too. How funny is this? i would like to say these were chewy and perfect but they turned out flat and stuck together. What’s shortening? It’s not on the recipie list but is mentioned in the directions. And what kind of measurements are ‘T’ and ‘C’ please? In the ingredient list, “Butter flavored Crisco” is the same as shortening. It is a type of fat used in baking. Do you live outside of the US? If you don’t have access to shortening you could use margarine or butter. I do think the shortening helps keep them soft and gives them a good shape. They are best fresh, but you could make them a couple of days ahead if you store them well in an airtight container. You could also bake them farther in advance and freeze them. Let me know if you have any more questions! Thank you, thank you, thank you, thank you for these cookies! My FAVOURITE cookies EVER! My only change to the recipe is that put like 3 times the spices and mix them up a bit. So good and spicy! I made these cookies and the pumpkin ice cream for Thanksgiving. I set them out for people to eat separately or make sandwiches out of them. Everyone loved them!! I was so happy how they came out, thanks so much for a different idea! Our kitchen is egg free, dairy free and gluten free, so I made these with a few adjustments – and they still turned out great! Perfecting my second batch of these for a cookie exchange in two weeks. My family is loving it. I used half butter and half shortening. Also, I brushed half of the cookie with fresh orange zest and then dipped that half in white chocolate. My family likes these the best. Thanks! I”ve made this recipe for years w/ the exception of oil instead of crisco (which is what I usually use in cookies). The oil doesn’t make them flat and I LOVE these at Christmas time. Thanks for sharing this recipe w/ the world!! Sometimes I even roll them in red or green sugar for the holidays. Great submit, very informative. I wonder why the other specialists of this sector do not notice this. You should proceed your writing. I am sure, you have a great readers’ base already!|What’s Taking place i am new to this, I stumbled upon this I’ve found It positively useful and it has helped me out loads. I hope to give a contribution & aid different customers like its helped me. Great job. I made these just now for our church social and can’t wait to here how they like them! I just ate two and they were the best ginger/molasses type cookies I’ve ever made. I just made these and slathered them with pumpkin spice cream cheese. Oh. My. Goodness. They were incredible and will be the perfect treat for pumpkin carving tonight… If any make it that long! Thank ladies! I have made these delicious cookies 4 times now. The first two batches, the cookies were fluffy. The second two batches were flat. I used the same ingredients, so i am not sure what happened…any thoughts??? Sara,I am ssssoooo sutpid.I KNEW that was a dumb question.So sorry.I just moved here from Mexico and I am tring to learn the English lanquage. (and spelling :)) Oh,and I guess I should tell you,the E mail that I put in really isn’t my email,I do not have one.It wouldn’t let me post a comment with out it,so I put one in that I had seen on a website.So please do not send E mails to that person.But my name IS Anne. Yum. These are awesome. I made them teaspoon sized and turned them into sandwich cookies/ whoopie pies with your perfect cupcake filling and frosting (doubled, of course) everywhere I take thm they get gobbled up!! I made these cookies this weekend. My 6 year old asked when I was going to make ginger cookies and since I had never made them for him I decided to try out this recipe. My 4 year old son says, “Oh cookies! Can I have one? !” I tell him of course, but that he might not like them because they are a different kind I’ve never made for him before. He tries one bite and says, “Oh yum! Can I have them all? 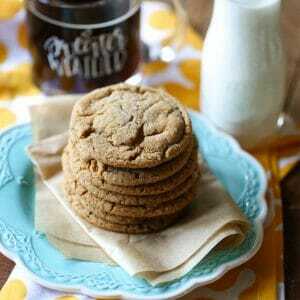 !” =) When my 6 year old got home I thought he was going to be so pleased when I told him I made him ginger cookies. Turns out he wanted ginger bread cookies…or so he thought…until he took one bite and grabbed three more cookies and ran out of the room as fast as he could so I wouldn’t stop him. Needless to say they were a hit! Thank you! Disappointed in this recipe. I was looking for a chewy molasses cookie which the author has claimed and these are NOT. I even tried the recipe twice thinking I did something wrong. Both times they turned out cake like and very dry on the edges. I love these cookies. 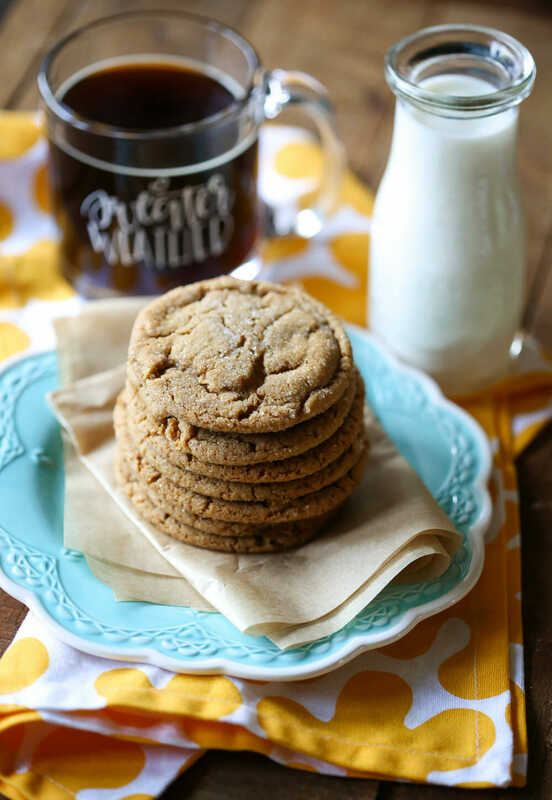 They are my go to for ginger cookies…and the ginger pizzookies are out of this world. Thanks!! Thanks for the recipe, these were shared in a recent cookie swap and were a hit! (Photo here – https://www.flickr.com/photos/goffstownpubliclibrary/15985462222/). Add a dash or two of cayenne pepper if you like spicy things! It really kicks them up a notch. This recipe is equal parts perfection and Christmas all wrapped-up into a few glorious bites. Bravo Ladies!! The addition of milk chocolate chips to ginger cookies is amazing! Drizzle with white chocolate and you have gourmet!! Thankya for the help and recipe! I learned I liked chewy ginger cookies at the Barnes & Noble cafe last Fall, where they had huge ginger cookies that were amazing; excited to learn to make them myself! You don’t have to smoosh…I just enjoy it, haha! 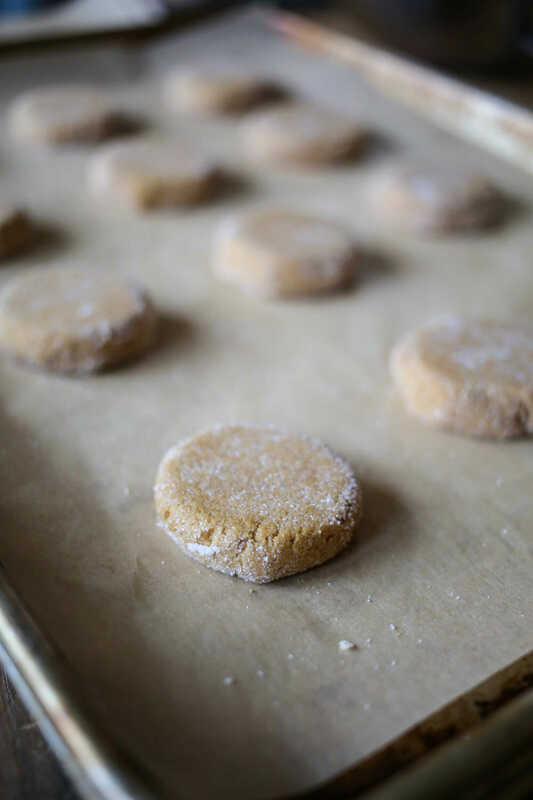 Best spice cookies I have made and very easy to make. Yay, this makes me so happy!!! Where did the recipe go:( I’m desperate! So sorry!! We’re having some trouble with our printable recipe card feature and we’re doing some work on it last night when traffic was slow; it should be working now.